Dinner parties… milestone anniversaries… wedding celebrations…. 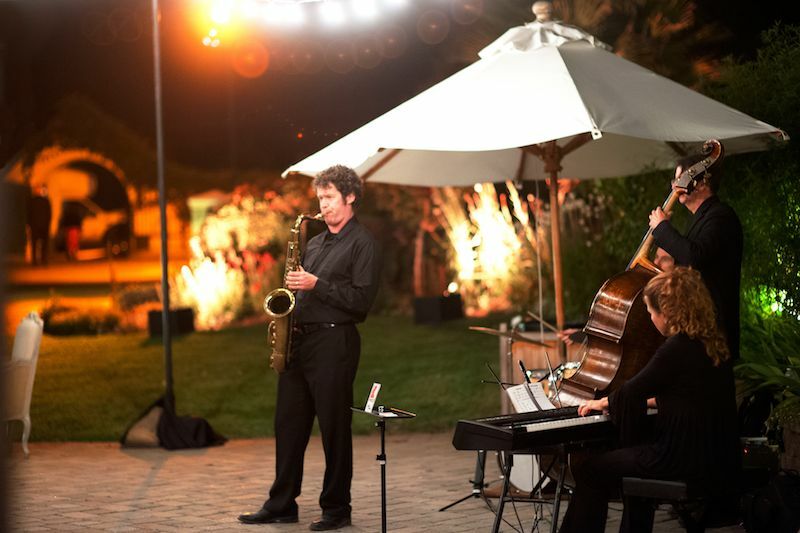 Hundreds of families have trusted us to provide the sound track to their most memorable occasions. Stephanie & David’s first dance. Photo by Jane Grossenbacher. Outdoor evening reception. Photo by Christina Richards. A dinner at the Penthouse Suite of the San Francisco Fairmont Hotel. Photo by Skyebean Photography. 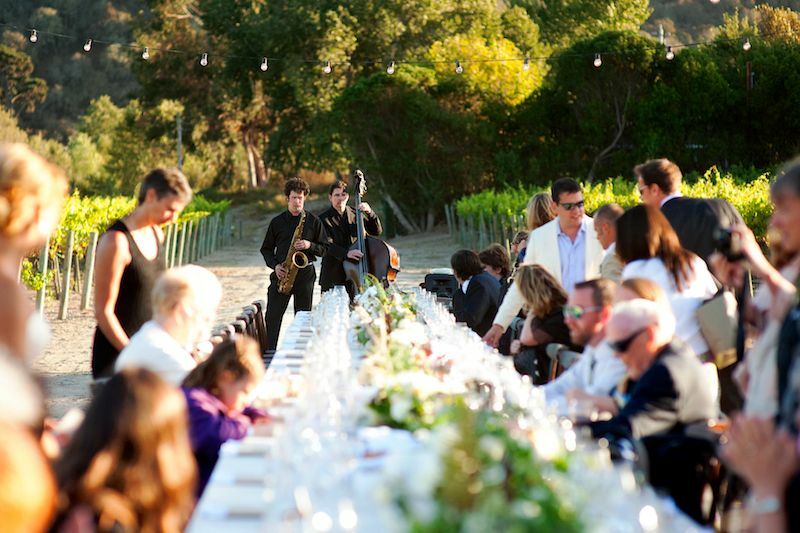 Dinner in a vineyard. Photo by Christina Richards. 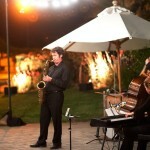 Outdoor performance at a private estate. 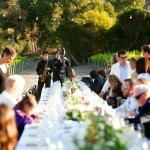 A wedding reception at Chateau Julian, Carmel, California. Photo by Christina Richards. 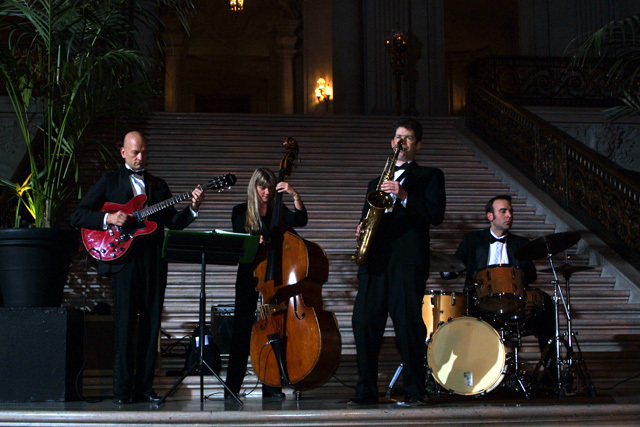 A gala black tie event at San Francisco City Hall. Photo by Jan Lundberg. 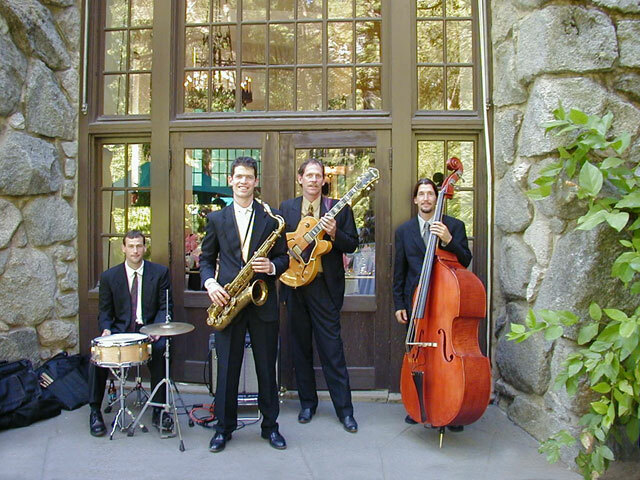 A wedding reception at the historic Ahwahnee Hotel, Yosemite National Park. Anton announces the bride & groom at Thomas Fogarty Winery. Photo by Scott Wall. ... as well as countless fine wineries, inns, and private homes. The main factors that determine our performance fee are duration, number of musicians and venue location. For a quote, or to discuss a potential event, please contact us. We are based out of Seattle, Washington and San Francisco, California. 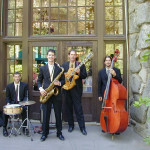 Most of our work is in the pacific northwest, but we occasionally travel elsewhere to perform for clients. 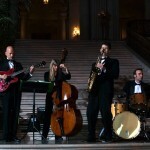 Venues further than an hour from San Francisco or Seattle incur a travel surcharge. Do require a deposit? What is your cancellation policy? We are normally paid by check or cash. We are happy to accept credit cards as well, but we add a 3% fee to offset our additional cost. When do you expect the final payment? The balance must be paid by the day of the event, upon event completion. If this is not feasible, please let us know in advance so that we can make alternate arrangements. How do you/we decide what songs you’ll play? 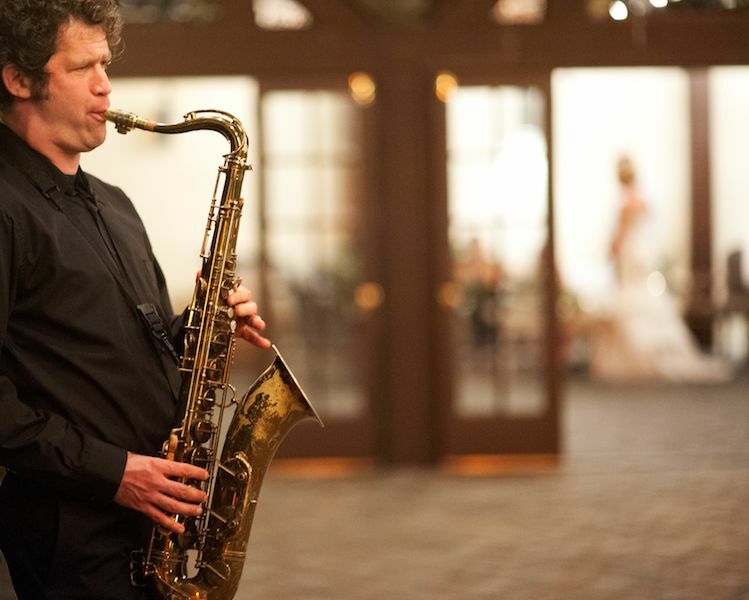 We like to have the freedom to choose songs as we go, depending on the feeling we get from the event and your guests -- in terms of their energy level and how we see them respond to different sorts of music. We never begin an event with a predefined set list. That said, if you have any particular songs that you'd especially love to hear or styles that you prefer, we're happy to accommodate your wishes as much as possible. We're happy to field requests on the fly. If an eccentric guest comes up and asks for something we think you might not want us to play, we'll ask them to OK it with you first. Do you ever work with a vocalist? Yes, we do. Some exceptional vocalists in particular whom we work with are Nicolas Bearde, Jackie Ryan, Jennifer Lee, Kenny Washington and Ed Reed. Will you have a microphone for us to use? If we are performing with a vocalist, or for a large number of people, we will have a microphone and sound system which you may use for announcements and toasts and the like. Otherwise, we generally do not use a central sound system, so if you need a microphone please let us know in advance - we can generally work something out. We can also arrange for a wireless microphone for an additional fee. How much space do you require, to set up? This depends on the number of musicians we're performing as. Some examples: A quartet of sax-keyboard-bass-drums would require approx. 8'x10'. A trio of sax-keyboard-bass might need just 5'x8'; A sax-keyboard duo 4'x6'. A sound system, when needed, will require a few more feet of width. Remember that you should also budget a bit of space in front of us where no people will be seated. In general, we need just a single grounded 110v (everyday, three-prong) outlet within 15 feet or so of where we'll be playing. If it's further away let us know and we'll bring the appropriate extension cords. We don't draw much power; 5 amps is more than enough, so any normal circuit will be fine. When we use a full sound system, we again need only a single grounded outlet, but our power consumption may go up to 10amps. This is still fine for a normal circuit, as long as it is not shared by other high-consumption devices such as stage lighting or heating. What if our event goes longer than we expect? If you are unsure about how long the event will go, there are a couple ways to handle it. First, you can book us for a longer period of time to be safe. Alternatively, you can request that we be available for overtime. In that case, we'll ask you as our allotted time is coming to an end whether you'd like us to continue longer. The first way is simpler, and will be less expensive if you wind up using the extended time... but the second option may be preferable for you if you see overtime as an unlikely possibility you'd like to provide for. It's very important to us that our guests be able to converse easily. Are you able to play quietly? We are extremely sensitive to volume issues. Conversation is frequently an important part of the private events we play, and we make it a point to play as quietly as necessary to honor that fact. On several occasions we have performed in very close quarters for the boards of directors of Fortune 100 companies, while they converse. Our standard attire is all black: black shirt, slacks and shoes, with an optional black sportcoat. It is a classic look that we find understatedly stylish, and it suits our music. For black tie events, we are happy to wear tuxedo. Our event is outdoors. Will you refund our money in the event of rain? Virtually all of our outdoor performances have rain contingencies indoors or with tenting. We normally require full payment regardless of weather, but if you have a unique situation, we are happy to discuss it with you. Our event site says that amplified music is prohibited. What does that mean for us? More often than not, that means that the venue does not permit loud music. 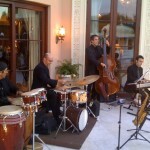 Since jazz is inherently an acoustic music, we do fine in such cases, despite the fact that we use some amplification. In some cases, however, the site's request may be based on a local ordinance that forbids any electric amplification. That can be a bit stickier, though there may still be ways for us to work around it. Feel free to have your site coordinator call contact us at 510 654-3221 or through this website. I like Anton Schwartz's CDs and I think they’d be nice as a gift for some of our guests. Can we buy the CDs at a discount? Absolutely. All of Anton's CDs are very listenable, even to people who don't know much about jazz. We are able to extend the following prices to you for the CD's, individually or in combination - see below. By comparison, Amazon.com buys the CDs wholesale for $11 and sells them for $15-18. * The Holiday Time CD has additional special pricing - great for winter holiday events. Do you take breaks? How frequently? Yes, we take a break every hour, for about fifteen minutes. So for a four hour performance that would be three breaks. Can we have you coordinate one of your breaks with our (speech / toast / award ceremony...)? By all means. We can be flexible about when to take our breaks, so long as we don't go for more than about 75 minutes without a break. Are you able to provide recorded background music during your breaks? In many situations, yes. 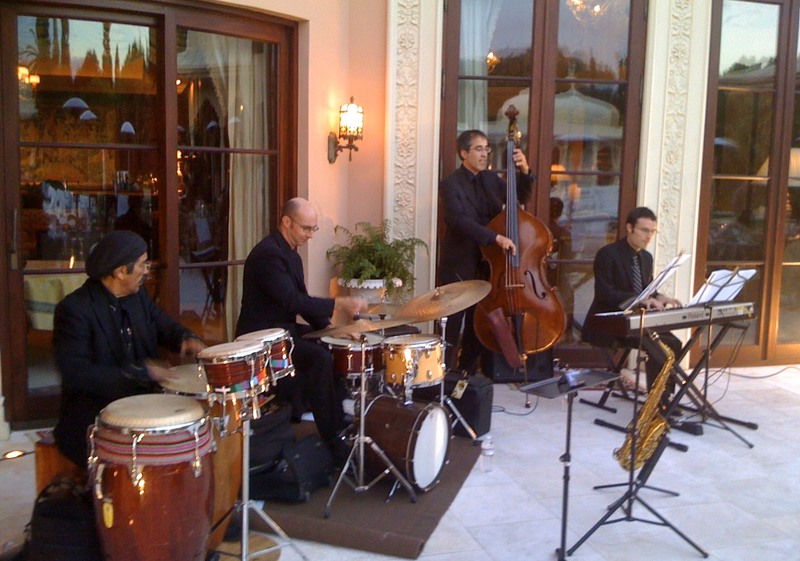 For smaller events we often play acoustically, without a sound system; in those cases, many venues (restaurants, wineries, hotels) are already set up for background music. If yours is not, give a call or an email, and we may be able to find a solution. Generally we can be set up and good to go within fifteen minutes of our arrival. We allow more time than that simply to account for traffic and unforeseen circumstances; exactly when in advance we plan to arrive depends mostly on the the venue and the time of day (e.g. rush hour). When we use a central sound system we allow an extra hour for setting that up. If all that is more than you want to know, the bottom line is: if you want us to start at 7pm we'll be set up and ready to start playing at 7pm. We'd like you to be all set up (x) hours before the event. Will that be a problem? We are very good at setting up quietly and professionally, even when an event is already in progress. If the situation is such that we must be set up well in advance of our performance time, we charge a surcharge for the time we spend waiting. 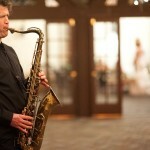 Do you play music for wedding ceremonies? What sort of music? 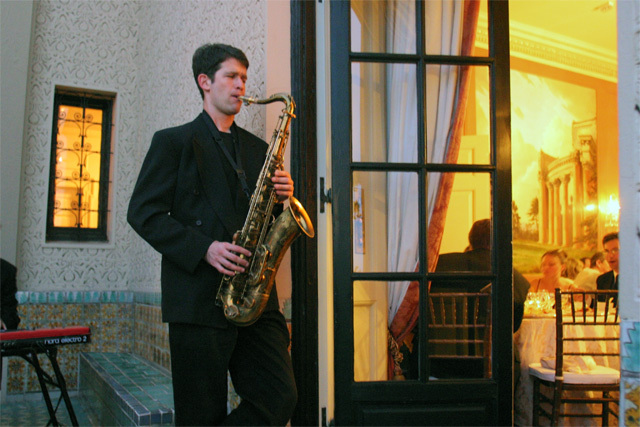 Yes, we play cermony music in various formats ranging from a solo instrument (saxophone, guitar, or piano) to duos and trios. 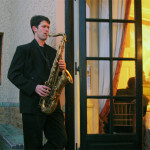 The most popular format is probably sax-guitar or sax-piano duo. 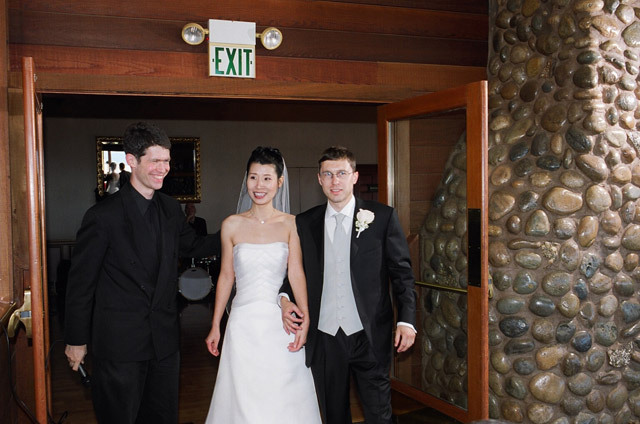 For recessional music (after the ceremony, for the bride & groom to walk away to), we can play the traditional Wedding March by Felix Mendelssohn, or an alternate classical piece such as Beethoven's Ode to Joy -- or, many times it is appropriate to just play an upbeat jazz tune, marking the beginning of the reception phase of the wedding. Some nice choices for that include Our Love Is Here to Stay, If I Were a Bell, Get Happy, Anything Goes.... Occasionally we've ventured into non-jazz territory with tunes such as When I'm Sixty-Four, Happy Together, How Sweet It Is, Signed Sealed Delivered, and Linus and Lucy (the Peanuts theme). 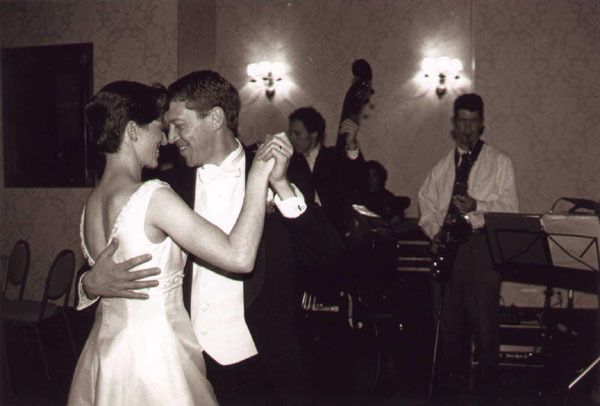 Do you have any songs to recommend for a first dance? 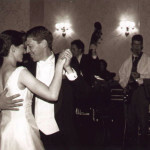 How about songs for a father/daughter or mother/son dance?